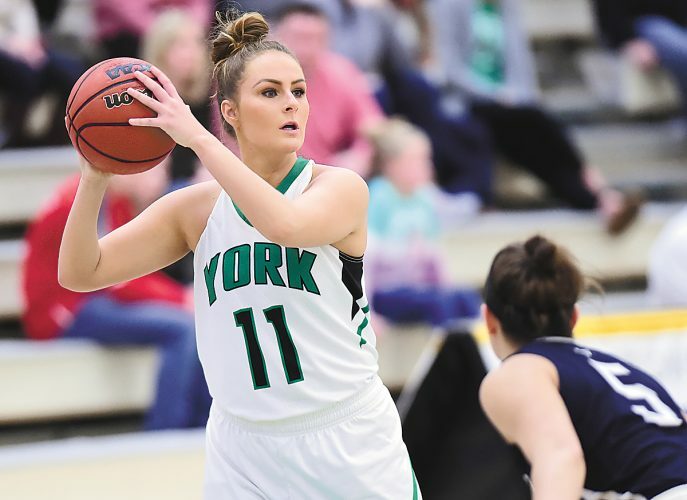 MOUNT UNION — Juniata Valley won the first two games against Mount Union Monday, both by more than 10 points. Then the Trojans turned the table. The home squad rattled off wins in the next three sets for a 3-2 opening-night finish in Inter-County Conference volleyball. The Hornets wins were 25-13 and 25-9; the Trojans took it with 25-19, 25-15 and 15-10 victories. Mount Union coach Tessa McCormick said she was proud of the way her young team — only two seniors — rebounded. “They could have just stopped. 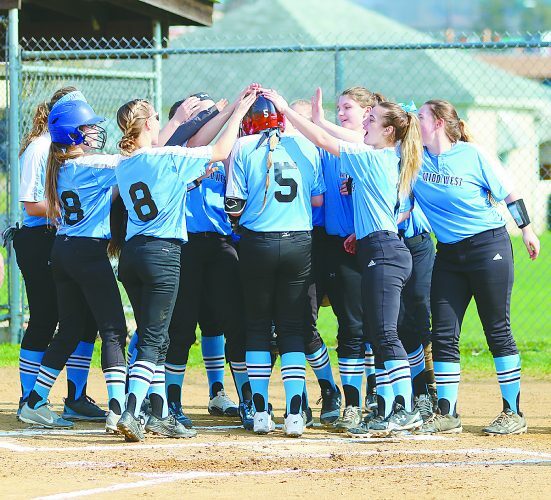 Some of them, this is their first time playing varsity,” she said, admitting she was mortified by some of the simple mistakes that allowed Juniata Valley to get the early lead. “Once they got the first two sets out of their system they just relaxed and played,” she said. Kadyn Crisswell was on her game with 20 service points — six of them aces — and 25 assists. Destinie Myers also had 25 helpers. Morgan Brumbaugh and Camille Posey each had 12 kills. Mount Union also won the JV match. The Trojans (1-0, 1-0) host Moshannon Valley on Thursday. ELIZABETHVILLE –Tad Shellenberger had a hat-trick as Juniata defeated Upper Dauphin, 4-0, in a Tri-Valley League boys soccer Tuesday. Shellenberger accounted for the first goal of the game and both of the Indians’ scores in the second half. Juniata coach Jared Byler was pleased with the performance the Indians had, but says there is more work to be done. Dawson Harper scored the fourth goal for the Indians. Juniata travels to Susquenita today. J — Tad Shellenberger, 22:40; J — Dawson Harper (Garrett Meifert), 32:01. J — Shellenberger, 2:52; J — Shellenberger, 18:44. SHAMOKIN — Midd-West was running on all cylinders both on offense and defense Tuesday, defeating Shamokin 10-0 in a Heartland Conference boys soccer game. Carter Knepp, Chase Strohecker, Evan Eppley and Canyon Zeigler each scored two goals for the Mustangs. Aiden Steininger and Dominic Abate had a goal apiece. Midd-West made it easy for goalkeeper Chase Roush, who did not have to face a single shot on goal from the Indians. The Mustangs also won the JV game, 9-1. Midd-West (1-0, 1-0) travels to Montoursville on Thursday. WM — Aiden Steininger (Connor Erdley), 10:24; MW — Evan Eppley (Nic Eppley), 11:20; MW — Canyon Zeigler (Chase Strohecker), 20:02; MW — Zeigler, 21:38; MW — Dominic Abate (N.Eppley), 24:06. MW — Strohecker (Zeigler), 42:18; MW – E.Eppley (Strohecker), 46:35; MW — Strohecker (Stefan Leitzel), 48:26; MW — Carter Knepp, 64:15; MW — Knepp, 66:00. Shots: MW 21-0. Corners: MW 16-0. Saves: MW-0 (Chase Roush), S-11 (Hunter Bates). MILTON — Brian Renno hoped for a good outing against Meadowbrook Christian, a team that took Belleville by a goal in overtime in the Thunder’s own tournament over the weekend. Instead, Meadowbrook’s Dylan Stokes scored a hat trick to lead the Lions to a 3-1 victory in boys soccer Tuesday. Belleville Mennonite (0-3) travels to Bald Eagle Area Saturday. M–Dylan Stokes, 19:32; B–David Yoder (Rhiley Parks), 14:28; M–Stokes, 5:51. HALIFAX — The East Juniata offense did not allow Halifax time to breath as the Tigers out shot the Wildcats 33-1 leading to a 9-0 Tri-Valley League girls soccer victory on Tuesday. Hailey Swartz and Brianna Henry each scored two goals for the Tigers while Kierstyn Fogle, Maddison Coudriet, Thea Neimond, Emily Wert and Cypress Feltman each a a goal as well. East Juniata (1-0) travels to Susquenita Thursday. EJ — Kierstyn Fogle (Paige Crissman), 6:49; EJ — Maddison Coudriet, 12:52; Hailey Swartz (Fogle), 17:58; Thea Neimond (Coudriet), 22:17; EJ — Emily Wert, 25:53; Brianna Henry (Leah Sankey), 34:25. EJ — Swartz (Sankey), 59:40; EJ — Henry (Sankey), 71:59; EJ — Cypress Feltman (Paige Crissman), 78:00. Shots: EJ 33-1; Corners: 7-0. Saves: EJ-1 (Kayla Forry), H-24. MCALISTERVILLE — It wasn’t exactly how Juniata Mennonite wanted to start its first league game but, a goal late in the first half carried over to the second and Northumberland Christian claimed a 3-0 victory in their Allegheny Christian Athletic Association girls soccer game on Tuesday. With 1:36 left in the first half, the Warriors’ Emily Cargo scored, giving Northumberland a 1-0 lead at the break. Emma Daku-Treas and Kaitlyn Bookwalter each added a goal in the second half. Juniata Mennonite (2-1, 0-1) travels to Walnut Street Christian Friday. N — Emily Cargo, 1:36. N — Emma Daku-Treas (Emily Garvin), 34:27; N — Kaitlyn Bookwalter (Karina Yoder), 17:30. Shots: N 20-10. Corners: 2-2. Saves: JMS-17 (Rachael Delancey), N-10 (Rebekah Hayner). MUNCY – Midd-West powered through offensively in the second half leading to a 6-0 victory over Muncy in a Heartland Conference field hockey game Tuesday. Brenna Brown led the way for the Mustangs with two goals and an assist. Lynsey Fultz also scored a goal in each half. The Mustangs faced just three shots in the game. Midd-West (1-0) hosts Danville Thursday. MW — Lynsey Fultz (Brenna Brown), 5:09; MW — Brown, 3:43. MW — Marlo Spriggle, 12:56; Brown (Jaylynn Blair, Fultz), 2:41; Blair, 2:02; Fultz (Alexia Griffith), 0:24. LEWISBURG — Midd-West finished in second place with a team total of 375 in its Heartland Athletic Conference golf meet Tuesday. Cade Crossgrove had the best score for the Mustangs and finished third overall with an 84. Hunter Beward who shot a 94 finished second for Midd-West. Brady Wenrich shot 98 and Connor Steffen scored a 99. Midd-West (5-3) goes to Mifflinburg on Sept. 18th. Cumberland Valley 315, Red Land 316, Carlisle 354, Mechanicsburg 369, Cedar Cliff 399, Mifflin County 404. CARLISLE — Mifflin County’s 404 was the lowest of the season as a team, but the Huskies found themselves in the back seat of Tuesday’s Mid-Penn Commonwealth golf match. Kolbi Knode and George Jordan each brook 100 — Knode scored a 95 and Jordan a 97. Bryan Chilson shot a 105 and Adam Sheetz scored a 107 to round out the top four golfers for the Huskies. 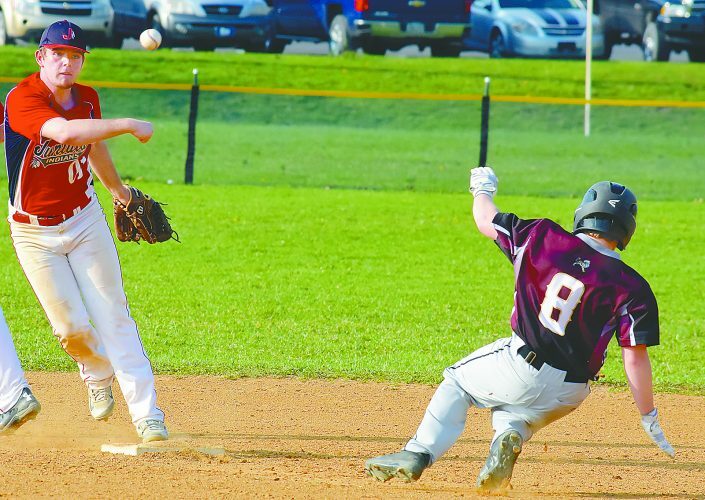 Mifflin County (0-5, 0-15) travels to Cumberland Valley Thursday. Kolbi Knode 95, George Jordan 97, Bryan Chilson 105, Adam Sheetz 107. 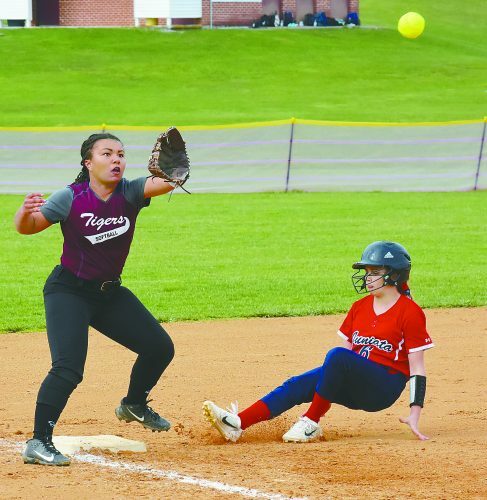 LEWISTOWN — Olivia Kahley and Sky Curry did something Tuesday that no one had accomplished this season prior to that. The tandem that plays No. 1 doubles for the Huskies won their match against Cedar Cliff. And the Huskies almost got another. The Colts won the team score, 4-1. Kahley and Curry won first-set tiebreaker, 7-6, then put away Rachelle Smith and Sid Boyle 6-3 in the second set. In No. 2 singles, Alexis Maxwell won her first set but lost the match in a 7-6 third. Mifflin County (0-7) heads to Carlisle Thursday. ELLIOTTSBURG — Greenwood’s first official cross country meet saw two Wildcats finish in the top 10 while Camp Hill claimed the win. Greenwood’s Rachel Peters came in fifth overall at 25:53.2. Gabrielle Cameron was eighth in 26:54.8. Greenwood heads to Kutztown Saturday for the PTXC10. 5, Rachel Peters, 25:53.2; 8, Gabrielle Cameron, 26:54.8; 16, Kiersten Burch, 30:39.7; 17, Renee Dubaich, 31:07; 18, Bayley Hess, 32:11.1.